insertion is then closed with steri-strips. caregiver or diabetes healthcare team. secured to the skin using adhesive tape. It is water resistant too. smartphone is not nearby or switched off. looking ahead and not just catching up. Initially it was simple things that improved. needles. Then there's the bigger picture. 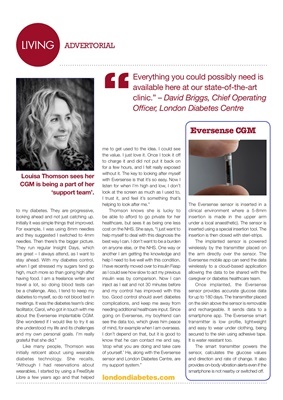 about the Eversense implantable CGM. helping to look after me." help I need to live well with this condition. of mind, for example when I am overseas.